A shuttle bus travels along Market Street at King Street Wednesday, June 7, 2017, in Chattanooga, Tenn. This year marks the 25th anniversary of Carta's electric shuttle. The way Chattanooga grows affects how its citizens get around. So, Chattanooga City Council members were told this week, their decisions about land use — where homes and restaurants, businesses and hospitals can go — have to be considered as the city's transit authority looks to the future. 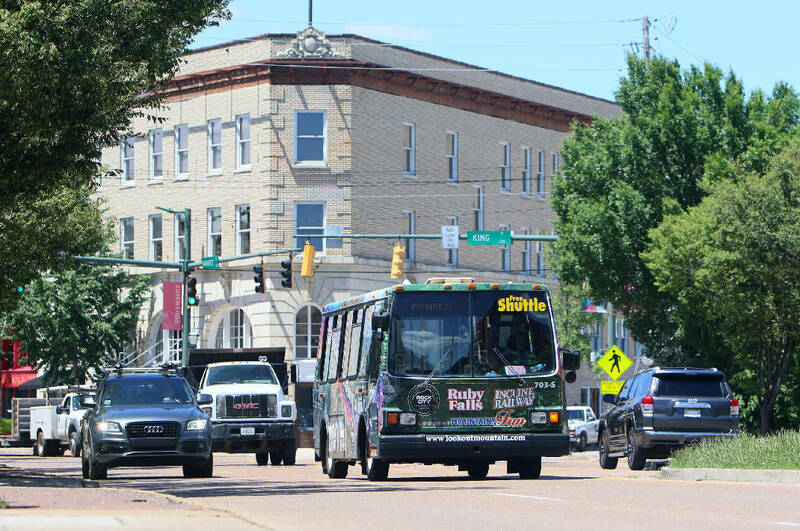 The Chattanooga Area Regional Transportation Authority is taking a year to study its fixed-route bus system and look at ways to change it to best serve the city. It's holding workshops this week and has done an online survey and stakeholder workshops to hear what city residents have to say. On Tuesday, CARTA Executive Director Lisa Maragnano and consultant Jarrett Walker briefed council members about the study and the council's possible role. Walker called transportation "the wall around your life." "That's places we can't work, schools we can't go to, places we can't shop. ... Some places are just too far to get to," he said. For bus riders, the key factors are how often the bus runs, or frequency, and where it goes, or coverage. Walker said people who drive cars or bike often don't understand that for transit users, "waiting is a dominant element of travel time." "Everything about the usefulness of transit starts with there being transit coming when you need it," he said. Getting the most riders on the bus requires fast, reliable and frequent buses with lots of connections to stops that people can access by foot easily and safely, Walker said. That's fine for people who live in the city core where homes, jobs and destinations, from the dry cleaner or restaurant to a doctor's office, tend to cluster along major streets. But it's financially unfeasible in spread-out suburbs and cul-de-sac development. Think of the commercial corridor on Brainerd Road vs. East Brainerd, where homes and businesses are farther apart and often set well back from the main road. The bus might travel in those areas, but less often and with fewer riders, Walker said. "It's impossible to do both [types of coverage] with the same dollar," Walker said, so the council's eventual task will be to seek the best balance between frequency and coverage. The mix now is about 55 percent of buses serving frequency and 45 percent on broader service. At a stakeholder workshop, 70 percent favored high ridership and shorter waits over greater coverage. Council members had a number of questions. Councilwoman Carol Berz asked how people get to the bus stops. She said there's a shortage of sidewalks and safe crosswalks in the city, so "even if we were going to walk there, we can't get there." True, Walker said, and a challenge for the council to pass on to city planners. What's the average walk to the bus stop? Councilman Russell Gilbert asked. About a quarter mile, Walker said, though people will walk farther if they think the service is worth it. Gilbert followed up, saying lots of people who don't live downtown need transit to get to the doctor or grocery store. That's why the council needs to consider ridership vs. coverage, Walker said. In a high-ridership model, people who don't live near the bus route "are just out of luck, there's no sugar-coating it," he said. "This is why this is hard." The dense downtown can support high frequency and ridership, but "that leaves the rest of the city in east, north and west underserved, with a disconnected grid, poor safety and walkability," Walker said. "We're going to start a public conversation which will come around to you eventually for a decision," he added. The study will continue through the year, and plans call for presenting draft recommendations to the public this fall, according to CARTA's website. Learn more about the CARTA study at https://tinyurl.com/ydgox3re.